A tendency to set concepts, phenomena, and abstract notions into images suits children, who create visual pictures in order to understand the meanings of words they don’t know. They exasperate their parents with repeated questions, while in their minds, each synonym or explanation makes the new word better contoured, and leads to revealing metaphor, word-image, thought-emotion, something that sets the static thing into motion. Acoustic associations of letters inside words are as important as logical explanations. Children learn to speak by associating words with objects or persons they can see and touch. With references missing, imagination builds descriptive images based on information the brain can process, a short film where the meaning of a word is gathered in the unfolding “story” of that word. A foreign language can be learned in the same way. Before it can infiltrate a person’s mental structures and be spoken naturally, without having first been “translated in the mind,” a foreign language operates with the images of the word that can be transposed from the mother tongue. A foreign word is acquired when its images in the mother, and the foreign, tongue overlap. It is only then that we can claim to “think” in a foreign language. Or, more poetically, dream in it. Sometimes, expressions that are rich and meaningful in the mother tongue may end up shipwrecked on a foreign shore. An idiom is more than its words. It collects and juggles cultural references, myths and the folk philosophies and the stages of civilizations through which it has passed, all finely tuned by music, accent, and nudgings from the historical context in which it has found itself. Language gathers all the stories of its words, the images and metaphors in order to recreate a world from scratch in a new key. For writers, immigrating into a new world is done first in a foreign language. The process amounts to rebirth in a different “womb of words,” at times requiring a symbolic, if nonetheless tragic, death. The psychological impact of such a profound displacement exceeds any effort to learn a new language. Moreover, while acquiring some skill in his or her adopted tongue, a writer may still not be able to create in it, lacking access to the intimate nuances of the other tongue, unable to activate the mental ramifications of creation, the mechanisms that yield the ineffable. Many writers who enter a different culture feel that their identity has been altered. Uprooted, suspicious and insecure, they invent a territory between cultures where they remain suspended, a sanctuary but also an excuse for their failure on either shore. That is when a writer feels hat the strongest ally, language, has been the betrayer, falling short of expressing the depths of the writer’s soul. Notions about translation and the relationship between writer and translator have been much debated. Literature abounds with remarkable translators, who have transmitted sacred texts and ancient manuscripts, world classics and landmark books, and yet writers and theorists alike continue to obsess over the traduttore-tradittore (translator-traitor) problem. The essential element of this controversy is metaphor itself, the key needed to decipher the symbols that differentiate two languages from each other. Language is a mysterious animal, partly mythical, partly alive and unfathomable. Metaphor will always protect the languages uniqueness, thoroughly lock its magic, and drop the key. Words live within us even when we are silent. There is an intuitive feeling that one can communicate beyond words and that understanding is not necessarily tied to language or speech; rather it is our ingenuous thirst for knowledge and individual sensitivity. Curiosity plays a major role here; just as a certain spiritual or cultural level facilitates access to encoded communication, beyond language, beyond historical moments, and the boundaries of civilization. For example, we can appreciate without fully comprehending the beauty of a manuscript in Sanskrit, and we can feel profound emotion watching a play performed in ancient Greek, even if we do not know the language. The arts have the exquisite ability to sublimate language, bestowing on it universality through a revealing metaphor, reaching new heights of understanding beyond words. The opposite phenomenon also occurs. A cascade of words in one’s own language sometimes can be completely ineffective, empty of meaning, communicating nothing. How many words do we need to make ourselves understood? What is the essence of communication, and what is the role metaphor plays in its evolution? To communicate means, etymologically, to convey what we have in common. This process implies an interaction based on an exchange of information not only at the conscious level, but at work on the unconscious mind refining the message. After all, the final goal of communication is change. Communication mainly targets the destruction of limits imposed by space, matter and time, by the separation between beings and phenomena; it tries to modify the reality one knows with the hope of getting beyond in the wish to improve and expand one’s life. The quality of communication stems from the capacity of each individual to develop natural gifts and desire for knowledge. Today’s new forms of communication– quick, efficient, etc. – do not assume beauty, profundity or spiritual liberation as their goals. Everything has a price. Language continually evolves, sometimes losing its power to impress or express no matter how sophisticated the means of communication. Communications use and abuse technology, cybernetics, and electronics to the point of detouring or exhausting the magical and primordial force of the word as an absolute beginning and a supreme indication of difference. What can we do to give the word breathing space, while capturing its meaning yet keeping its ineffable qualities? In human evolution, speech appeared naturally as a need to fulfill, to reveal the evolution of conscience. Communication was an ultimate goal. In the beginning, words expressed the reality of human perception showing the way things are. From drawings carved on cave walls to great biblical allegories, from hieroglyphics to cabalist manuscripts, to Plato’s dialogues or the Homeric epics, metaphor continued to gain importance to communication, deepening its inner mystery, protecting it, and passing it on to following generations. What is a metaphor? It might be defined as a stylistic form in which a word or a phrase is used to convey a meaning different from the one it usually carries. Metaphor also implies a comparison, a symbolic similarity. The word needs time to find its full self, to achieve an ideal weight, an ineffable density, a proper consistency, in order to have its maximum impact. Ideas, mental or spiritual forms of thought generate the word; once they find their way into the word, they unravel and become powerless. Their uniqueness is circulated and enters the public domain, open to transformation, interpretation, distortion or deviation from the original meaning, all of which may still enrich the expression yet preserve its originality. In essence, communication consists of the spoken, living word. Often, living words are perishable. Once uttered, they may disappear or be perverted, or lose their intensity, not unlike things that lose their strength and glitter once they are removed from their native environment. Great orators vainly assume that the word, whether spoken or written, ends up in the same place, returns to the great book from whence it came. However, the true master reaches an eternity beyond words. When one looks at the Egyptian pyramids, or at the Sphinx dazzling in the mystery of its simplicity, one hears an entire civilization talking, telling its story. The order, the angles and the waves of the stone are a concise and brilliant language, as profoundly significant as Beethoven’s music or Van Gogh’s paintings. A revealing metaphor is born out of the beauty of primary simplicity as an essence of the world and its meanings rather than a display of hidden meanings. “The Song of Songs”, “Mahabharata”, “The Upanishads”, “The Dead Sea Manuscripts” and “The Life Road”, “The Tibetan Book of the Dead” or the comparable Egyptian texts are concentrated dialogues with a Divinity, metaphorical trips into the primordial spaces that generate existential concepts and laws, steps in guiding the spirit in its drive to perfection. They are fundamental milestones in the evolution of the expression of communication. The history of mankind rests on metaphors. What are religion, philosophy, arts, if not therapeutic metaphors to serve the soul in its striving to communicate, understand, and be understood? A word is itself a metaphor, contrasting the imaginary with the real, marking limits and superimposing an abstract structure on material representation. Metaphor wraps itself around the word, with all its fleshy layers, with its light and shadows undulations, with well-chosen sounds and significant silences, creating a unique cosmic body through the revelation of birth as a result of the naming. God used Man as a metaphor of genius to explore the limits of His own creation. He multiplied through us into words and left us free to forever try to decode the metaphor of His creation. Some take it as a gift, others as a curse; some perceive it as a burden, others as a privilege, depending on the Divine representation: whether it is the quintessence of good and compassion, perfection and harmony, or whether it embodies a mercilessly higher instance that puts its offspring through challenging trials only to satisfy its own vanity or whims. On the one side, religions unconditionally accept God; on the other, philosophies discuss Him, humanize Him through metaphors of existence, permanently challenging His presumably boundless limits. Mankind loves Him, fearfully, frightened by the unpredictability of earthly life directed by Him, and by the unknown that awaits after death. God controls lives without any promises or certainties, with no proof of an afterlife which remains the goal of all believers virtually from the moment of their birth. However, this authoritative relationship between the Creator and His creation can be broken by the intervention of the miraculous, the metaphor with which we measure our existence, like Magellans scrutinizing earth from the horizon. Hope. With hope in mind we will continue to navigate the unknown until light dilutes and becomes a phosphorescent string leading us into the future. 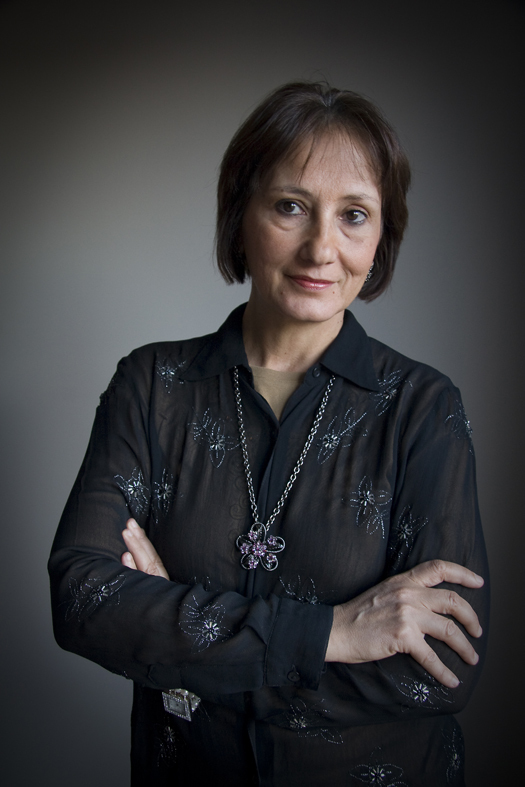 Carmen Firan, a poet and fiction writer, has published twenty books including poetry, novels, essays and short stories in her native Romania. Since 2000 she has been living in New York. Among her recent books in the United States are Inferno (novella, SDP, 2011), Rock and Dew (selected poems, Sheep Meadow Press, 2010),Words and Flesh, (selected works of prose, Talisman Publishers, 2008), The Second Life (short stories, Columbia University Press, 2005), The Farce (novel, Spuyten Duyvil, 2003), In the Most Beautiful Life (poems with photographs by Virginia Joffe, Umbrage Editions, 2002), and three collections of poetry published in New York:Afternoon With An Angel, The First Moment After Death, and Accomplished Error. In 2006, she co-edited Born in Utopia: An Anthology of Modern and Contemporary Romanian Poetry (Talisman House) and in 2008 she co-edited the anthology Stranger at Home. Contemporary American Poetry with an Accent (Numina Press, Los Angeles). She is a member of the Pen American Center and the Poetry Society of America.